On the eve of WWI the talented Swiss engineer Marc Birkigt built an 8-cylinder motor car engine of V-type construction. Later, this engine was adapted for aircraft, and given the official military designation Hispano Suiza 8a. It was progressively improved and as a result its power grew by 50 h.p., which by the standards of the time was a quite outstanding technical achievement. Its power was 200 h.p., thanks to the technological innovation of its construction which offered considerable potential for development. One of the most outstanding airplanes of WWI, the RAF S.E.5, was designed around Birkigt's engine from the very beginning. A little bit later an improved version was built, the S.E.5a, fitted with the 200 h.p. engine. During tests the S.E.5a greatly impressed the military, and its production began at once in enormous quantities at several plants. However, the rate of production soon fell substantially of 1,300 aircraft ordered, only about 800 were manufactured. It happened because of defects in the Hispano Suiza 8Ab engines. To solve this problem Great Britain purchased a license for production of the engine, and passed on the order to the factory of the Wolseley firm in Birmingham. The British copy of the Hispano Suiza, known as the Wolseley Adder, differed from the original only in its compression ratio 4.7:1, as against the 4.8:1 of the original. These engines began to be installed in the S.E.5a, but the result left much to be desired the Adder appeared to be too capricious and did not achieve the required number of turns, etc. 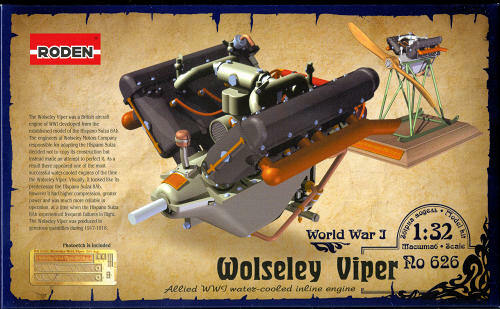 The Wolseley engineers decided to perfect the design of the engine, and in due course appeared the Wolseley Viper quite similar to the Hispano Suiza, but a substantially modified engine on the whole. The compression ratio reached 5.3:1 compared with the Wolseley Adder's 4.7:1, the crankshaft defects were eliminated, its construction was strengthened, and most importantly, the engine functioned without any interruptions during flight. Mass production began immediately because many more of the new S.E.5a were needed on the Western Front. With the arrival of this engine in the S.E.5a one distinctive feature of some earlier machines disappeared, namely the 4-blade screw, because the Viper produced sufficient rotation with a two-blade propeller. At the end of 1917 the first S.E.5a with the Viper engine reached the Front, where it immediately proved its superiority over all other types of fighter. After that the early build S.E.5a's with the Hispano Suiza engine were sent for repair and refitting with the Viper engine. These engines were made in great numbers during 1917-1918. 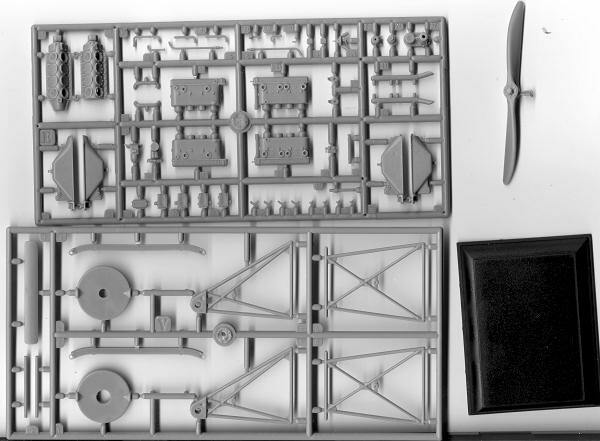 This is one in a series of kit that basically take the engines from various 1/32 WWI offerings and include a sprue that provides the stand. Obviously, this one came from their Se.5a kit and provides two sprues and a small fret of photo-etch. The molding is nicely done with only a few tiny sink areas on a couple of sump parts as well as some larger ones on the prop near the hub and on the mounts for the Rotary engine. Since this kit isn't a rotary engine, that stand option can be discounted along with the sink areas. For those interested, the only real option is whether to use the prop or not in the display. There are also some parts on the engine sprue that are not used in doing this particular engine so the builder needs to pay attention to this. The photo etch fret offers ignition wiring, some hub bosses and a few other little bits as well as a name plate. The kit comes with a black plastic stand on which the rest of the support for the engine is attached. Instructions are well done with nine construction illustrations. Apparently there was a printing glitch in terms of colors as an addendum sheet for the first six steps is included. Colors are all Model Master references. This sort of thing makes for an interesting display either by itself or in conjunction with the plane that it powered. It is a nice diversion from the norm for most and should prove to be a fairly quick and straight-forward build. Thankswww.scale-model-kits.com for the preview kit. Get yours at the link at a discount.